There are so many inherent contradictions in the concept of civic nationalism that it's hard to know where to even begin. It is described by political philosophers as a "non-xenophobic form of nationalism based on shared values such as freedom, equality, tolerance and individual rights." The fact that very few citizens of modern liberal democracies could even define it is hardly proof of its irrelevance in terms of political discourse; civic nationalism, or citizenship by social contract as opposed to a shared ethnicity or heritage, was the very ideological basis of post-revolutionary France and America and came to be viewed as the most civilized form of Statehood in the post-racial era after WWII. The fact that Canadian civic nationalists are actually liberals in the classical sense is exemplified by their crusades against Sharia law, and in favour of absolute free speech. They view the encroachment of islam into the public sphere as a violation of secularism, and the recent trends towards the criminalization of blasphemy as an assault on freedom of expression; both of these principles being at the core of the liberal democratic philosophy. The Canadian civic nationalist demand for mere surface-level assimilation by newcomers explains why their only real issue with mass immigration is the threat of islamification. They correctly identify the unlikelihood of "radical" muslim communities abiding by the minimal standards imposed on them in a liberal democracy, whereas they view other ethnic communities, no matter how large, as having no problem in doing so. By reducing citizenship to compliance with a few legalistic principles, themselves subject to change as morals evolve, civic nationalism inevitably leads to the dissolution of national differences. Its advocates would agree with Francis Fukuyama's oft-quoted statement that liberal democracies represent "the end of History," the final stage in the evolution of Western political systems. 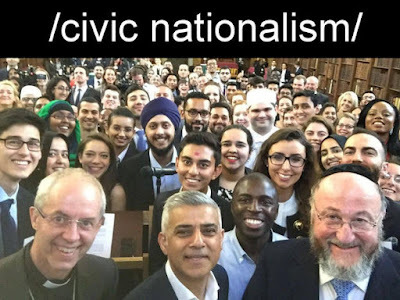 Consequently, if civic nationalism represents, in political terms, the "one best means" then, to paraphrase George Grant, how much difference can there be between societies whose faith in "the one best means"4 transcends even cultural and linguistic differences? This is besides the fact that the tacit acceptance of multicultural doctrine tends towards the elimination of national differences for other, more obvious reasons; nothing is more similar to an egalitarian multiracial nation than another egalitarian multiracial nation. If different societies based on individual rights and freedoms inevitably become indistinguishable from one another, then what is the need for nationalism? Patriotic gestures become another form of virtue-signaling. Canadian civic nationalists' reluctance to identify themselves, if they are of European descent, as part of a racial group in danger of becoming demographically irrelevant in the very near future, means that their criticisms of globalism are mostly symbolic. The separation of Canadian-ness from any racial connotations, and calls for assimilation being limited to adherence to so-called "Canadian values" (including the supreme value of multiculturalism) leaves all patriotic discourse interchangeable and subject to further deconstruction by the left. Conservative Party leadership front-runner Maxime Bernier's immigration platform, seen by many as a sane alternative to our current Prime Minister's policies, is nonetheless an example of civic nationalism's inability — or unwillingness — to identify the threat posed by immigration. On his official website, he states that newcomers should be expected to "adopt widely shared Canadian values such as equality of men and women, tolerance for diversity and respect for Canadian law".5 If tomorrow the entire population of Canada was mongrelized into a beige mass of indeterminate ethnicity, while still meeting these lukewarm pre-conditions, something will have been irretrievably lost. What exactly that "something" is, civic nationalists dare not say. The "Quebec Charter of Values" proposed by the Parti Quebecois under PM Pauline Marois is another example of this. 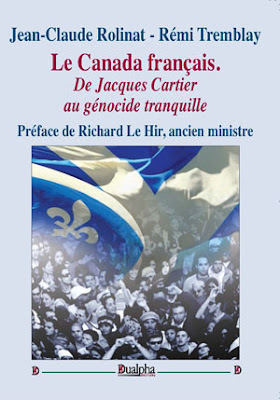 This last stand of Quebec identity, with its neutered vocabulary of shared language, secularism and the equality of men and women suggests that such sterile calls for superficial assimilation typical of civic nationalist discourse are unable to provide sufficient defense against globalism and the dissolution of national differences. The perceived double-standard of maintaining Catholic symbols at the National assembly, unarguably a key component of traditional French Canadian identity, while banning overt religious symbolism such as the hijab in the civil service, reveals the dissonance inherent in civic nationalism. All efforts to safeguard national uniqueness based solely on legal principles are ultimately futile. The preservation of a shared religious heritage, enforced secularism and religious freedom are mutually exclusive. In refusing to challenge the underlying assumptions about diversity, pluralism, and the Human Rights theology, Canadian civic nationalists cannot claim to represent an effective bulwark against the excesses of cultural Marxism in this country. The belief in individual freedom over all other considerations leaves them ideologically ill-equipped to reign in the ever-increasing moral decay illustrated by transgender mania for instance; at best their protests are limited to legalistic arguments against the government awarding them special privileges and banning criticism of their "alternative lifestyle". Fundamentally civic nationalism is based on the very notion that all lifestyles are alternatives, and that State-imposed definitions of normalcy are equivalent to authoritarianism. Grant's actual quote was "How much difference can there be between societies whose faith in "the one best means" transcends even communist and capitalist differences?" Although he was referring to the homogenizing power of technology, he mentions elsewhere in Lament for a Nation how liberal cosmopolitanism tends towards homogenization. Voat.co: I am Dr. Kevin MacDonald, author of The Culture of Critique and editor of The Occidental Observer. Ask me anything.